There are plenty neglected works by great composers that are fitfully revived only to be let go again, because they were rightfully forgotten. Schubert’s Lazarus comes to mind, or Schumann’s Genoveva. Fewer, nowadays, are the works by great composers that were once ignored and now rightly hailed to have been masterpieces all along. No work better suits this description than Schumann’s Violin Concerto. Clara Schumann, following Joseph Joachim’s advice, suppressed it. Unplayable. Drab. Tiresomely repetitive. Awkward. It’s half a miracle, given their attitudes, that ignorant Clara didn’t burn it. And so it was rediscovered and premiered by Wilhelm Kulenkampff. It’s gotten its fair share of high-profile recordings, since, but nothing like the other established romantic core-repertoire concertos. Performances are still rare. That’s a pity and a shame and here’s the recording that is Schumann’s best hope yet to change this! 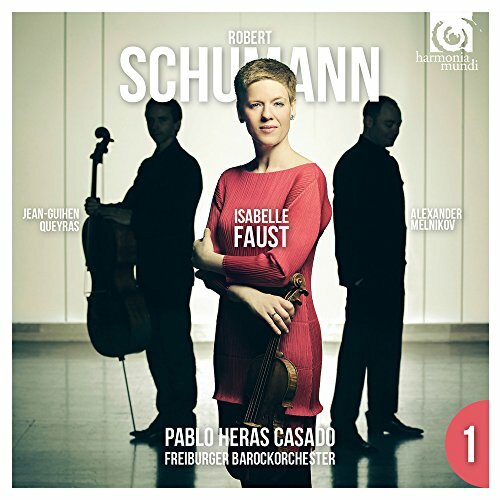 Isabelle Faust’s hushed gentility, the tender fragility, her faint, otherworldly touches bring the ears to their knees in the middle movement with its Ghost Variation motif. The following emergence out of this gorgeous but troubled netherworld of Schumann’s mind, when the main theme comes back, is all the more invigorating and sunny-optimistic. I heard her play the work with the Freiburg Baroque Orchestra under Pablo Heras Casado’s at Vienna’s Konzerthaus (together with the other two concertos performed by Alexander Melnikov and Jean Guihen Queyras—all on period instruments and gut strings) and loved it so much, I went right back the next night to hear it again. The result on disc matches and maybe exceeds what I head live. The Trio is a stupendous bonus; perhaps the beginning of the first set of period performance Schumann trios that will be the mainstream first choice for these works!